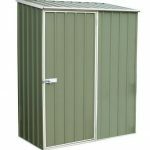 If you’re looking for a mid sized and durable shed as a garden storage solution, then this metal shed by Yardmaster is an excellent choice. The eaves and door height are a little restrictive, but the width of the sliding double doors allow you to use every inch of the space available, particularly if the optional set of shelving is purchased. 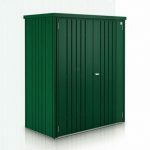 We liked the look of this shed, the green and silver contrasting the traditional and the modern, and also the fact that the painted finish, used inside and out, adds a further protective layer to the galvanised steel core. This gives it very good water resistant qualities, a feature also helped by the apex roof which carries water away. These factors, added together, are the reasons why the manufacturer has been able to supply a 12 year warranty against rust. This shed already represents great value, but the inclusion of an anchor kit as standard saves money for the consumer as well. One optional extra that will need to be bought if the shed is to be used for storage purposes is a padlock, although the handles are holed and ready to accept any standard padlock. In conjunction with the windowless design of this shed, it can be enough to deter would be shed thieves and keep your contents safe. We liked the traditional green colouring of this metal utility shed, as it helps it blend in with background foliage. For that reason it can help convert people who’ve previously only used timber sheds, especially when they realise the time and money they can save by not having to retreat their shed every year. The paintwork doesn’t only look great, with two coats evenly applied throughout, it also adds another protective layer against rain and snow. This weather protection is also aided by the apex roof, which also has another vital function in that it adds extra head and storage room to what would otherwise be a cramped interior. That’s because whilst the ridge height of the roof is 1.89m, the eaves height is only 1.63m. 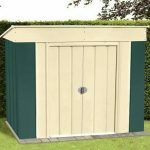 The base dimensions of this shed, however, are more generous than most we find in sheds in the 6 foot by 7 foot range, with an overall width of 2.02m and an overall depth of 2.17m. High tensile steel is at the heart of the cladding, which is then galvanised using the hot dipped method, adding extra strength as well as giving it excellent protection against the ingress of water which can lead to rust. The overall thickness of the cladding is 0.35mm, which is thin and lightweight, and yet still thicker than the cladding that we see in many metal sheds around the two hundred pound mark. When assembled, we found it to be stronger and more stable than we had initially expected. Whilst no flooring is included, which is usual in metal sheds, we were pleased to see that an anchor kit was included. This makes it quick and easy to assemble the shed onto an existing area of level concrete, but bear in mind that this base area must measure at least 2.02 X 2.17m. The screws included within the kit are stainless steel and rust resistant, showing the attention to detail provided by the manufacturer. As with all metal sheds there is no requirement for further treatments, other than routine cleaning and maintenance, once the shed has been assembled. For this reason, we expect to see long warranty periods on metal sheds, and routinely see 10 years being provided by the manufacturer. On this occasion, however, we were delighted to see that a 12 year warranty is provided against the occurrence of perforation damage caused by rust. The centrally placed double doors were the first thing we noticed about this shed, thanks to the contrast their zinc coloration makes with the surrounding area of green. It was good to find that while they slide easily, they also felt solid during movement. The overall width offered by the doors is 0.79m, which is wide enough to move objects such as a bicycle or mobility scooter into. The height of the doors is 1.58m, which necessitates ducking when entering or exiting the shed, so it would have been nice to see a taller eaves height which would in turn have allowed taller doors. 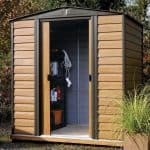 There are no windows included in this shed, but this is in common with many metal sheds that are designed for storage purposes. We like to see sheds that place an emphasis on security, as this is the greatest added value that a shed can have. Whilst it was good to see that the door handles were holed and ready to accept a padlock, it was disappointing that no padlock is included. This is a negative that we often find in budget metal sheds, however, and the windowless design adds extra privacy and therefore extra security. Shelves are always a good addition to a storage shed, as they allow for smaller tools and equipment to be stacked vertically on top of each other, thus saving floor space. That’s why we were pleased to see that a high quality stand alone shelving unit is offered as an optional extra with this shed. Measuring 2’6 X 1’8 it has four resin shelves, and makes up for the inability to screw shelving directly onto the frame. Other optional extras available are a water station, providing a greener way to water the garden, a sturdy wheelbarrow which can be stored away inside the shed when not in use, and a wheeled tool rack. All of these are useful additions, but we would have liked to see padlocks also available at the time of purchase, rather than placing an emphasis on the customer to source one elsewhere. Whilst the cladding was thin and light, it was still thicker than some used by metal sheds, and the high quality painted finish and use of rust resistant screws are a sign of the overall high quality. We expect to see galvanised steel cladding last a long time, but it was good to see that reaffirmed by the 12 year warranty supplied by the manufacturer. 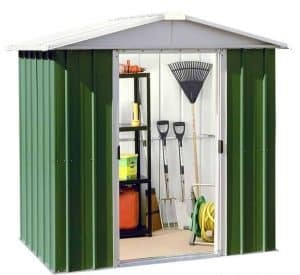 The width and depth of the shed create a base area which is more than adequate for most small gardens, but the vertical storage capacity is let down by the low roof and eaves. Between two of us, we constructed this shed in less than four hours and found the instructions easy to follow. As all the fittings and fixtures are included, there need be no delay once you take delivery of the shed in its flat packed form. 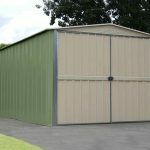 For a storage facility offering a little more than 6 foot by 7 foot, this represents very good value for money, particularly as it has such a good finish and long lasting components. 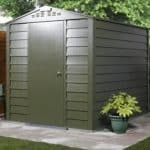 Final Thoughts: We liked the look of this shed, and the quality of the materials used, particularly as it’s backed by a long warranty period against rust. It’s a pity that the doorway is so short, and although the apex roof gives a little more space to move around in, it will steel feel a little restrictive inside for taller owners. 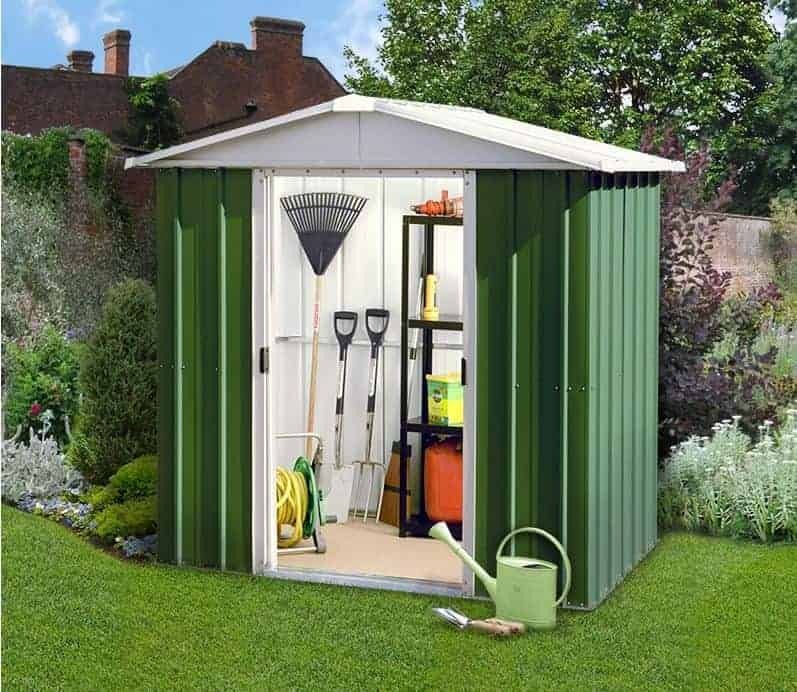 Nevertheless, this is a shed that’s designed for storage purposes first and foremost, rather than as a garden building to spend time in. With the addition of a padlock, this is a shed that fulfills this remit very well, keeping the contents secure and dry.